(Nanowerk News) Imagine pointing your smartphone at a salty snack you found at the back of your pantry and immediately knowing if its ingredients had turned rancid. Devices called spectrometers can detect dangerous chemicals based on a unique "fingerprint" of absorbed and emitted light. But these light-splitting instruments have long been both bulky and expensive, preventing their use outside the lab. "This is a compact, single-shot spectrometer that offers high resolution with low fabrication costs," says Zhu Wang, who was among the team of electrical engineers that created the device. The researchers published a description of the devices recently in the journal Nature Communications ("Single-shot on-chip spectral sensors based on photonic crystal slabs"). The team's devices also have an advanced capability called hyperspectral imaging, which collects information about each individual pixel in an image order to identify materials or detect specific objects amidst a complicated background. Every element's spectral fingerprint includes unique emitted or absorbed wavelengths of light -- and the spectrometer's ability to sense that light is what has enabled researchers to do everything from analyze the composition of unknown compounds to reveal the makeup of distant stars. Spectrometers usually rely on prisms or gratings to split light emitted from an object into discrete bands -- each corresponding to a different wavelength. 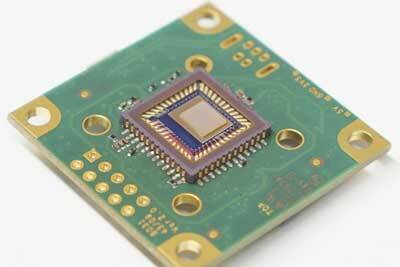 A camera's photodetector can capture and analyze those bands. The spectral fingerprint of the element sodium, for example, consists of two bands with wavelengths of 589 and 590 nanometers. That small size was possible because the researchers based their device on specially designed materials that forced incoming light to bounce back and forth several times before reaching the sensor. Those internal reflections elongated the path along which light traveled without adding bulk, boosting the devices' resolution. Now the team hopes to boost the device's spectral resolution as well as the clarity and crispness of the images it captures. Those improvements could pave the way for even more enhanced sensors.